I received my master’s degree in design (MDes) from the Royal College of Art in London in 1983. This was a three-year program. I elected to fulfill the requirements for both available concentrations: degree by thesis and degree by project. The thesis portion of my degree was undertaken in the Department of Painting and Printmaking, while my project work was undertaken in the Department of Ceramics and Glass. Upon graduation I was the sole recipient of the Major Traveling Award. At the time, this was the highest award granted by the RCA to a graduating student. Following graduation, I continued at the RCA as a Post Graduate Research Fellow in the Department of Ceramics and Glass (1983-85). In 1982, while still a graduate student, I began working as an architectural ornamentalist specializing in Islamic design. My first project was for the design and fabrication of several ceramic tile panels for the Ismaili Centre in London. The architects that I worked for on this project were the Casson Conder Partnership. Over the past 35 years I have worked on many architectural projects that required an overtly Islamic ornamental aesthetic. I have had the honor to work extensively on multiple projects at both the Masjid an-Nawabi (Prophet’s Mosque) in Medina and the Masjid al-Haram (Grand Mosque) in Mecca. This work began in 1990, when I was contracted to design the hand carved wooden ornaments for the interiors of the 27 sliding domes for the Prophet’s Mosque. These projects have included the ornamental design for the marble minbar for the Kaaba courtyard; ornamental components for the twelve architectural umbrellas for the two courtyards of the Prophet’s Mosque; the ornamental designs for the movable ceremonial stairway used by the king when entering the Kaaba; and more recently, diverse ornamental features for the expansion of the Grand Mosque. For each of these projects I was contracted with SL-Rasch GmbH in Stuttgart, Germany, who was in turn contracted with the Saudi Binladen Group. For the same client, I also designed the 40-meter wide clock face for the Abraj Al-Bait clock tower in Mecca. Other projects for other clients include the ornamental designs for the International Medical Center in Jeddah, Saudi Arabia; the ceramic and stained glass features for the new Tomb of Sheikh Hujwiri in Lahore, Pakistan; and ornaments for the New Senate House in Rawalpindi, Pakistan. 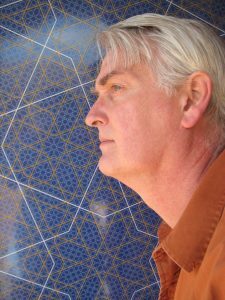 I am currently the senior ornamental consultant for a large research facility dedicated to the study of higher mathematics in Northern California that is designed in the style of the Alhambra. For a complete list of projects please refer to the C.V. section of this website. My design company is Bonner Design Consultancy; located in Santa Fe, New Mexico, USA (formerly London). I work with a wide variety of decorative materials and fabricating technologies. The ornamental media with which I am well acquainted include ceramic tile; cast architectural ceramics; mosaics; carved, pierced and inlaid wood; carved, pierced and inlaid stone; stained glass; cast bronze; etched aluminum; cast and carved gypsum; wood furniture; and textiles. I have work extensively with both traditional craftsmen and state-of-the-art manufacturing technologies. In this latter category, my work has including water-jet cutting, laser cutting, GFRG spray molding, and high relief composite substrate for applied mosaics, rapid prototyping, and CNC milling. I have recently been experimenting with aerated foam-cement as a medium for lightweight non-flammable architectural ornaments. I primarily use three software programs in my work as an ornamental designer: AutoCAD, Rhino 3D and Adobe Illustrator. I am an internationally recognized scholar of Islamic geometric design. In particular, I am a specialist in the field of traditional design methodology, with particular emphasis on the polygonal technique. Through many years of independent research and historical documentation, I have identified this methodology as the primary means by which Muslim geometric artists produced the diversity of geometric patterns that characterize this artistic tradition. I have documented my research and theories in a book recently published by Springer: Islamic Geometric Patterns: their Historical Development and Traditional Methods of Derivation. My book contributes to the study of this design discipline in three primary ways: Chapter 1 chronicles the historical development of this art form; Chapter 2 is concerned with the design diversity and geometric characteristics found within this tradition; and Chapter 3 is a highly detailed exposition of the design methodology associated with the polygonal technique. The final chapter is contributed by Craig Kaplan and concerns the use of mathematical algorithms to generate patterns with computers. This book has over 600 pages, with 105 photographs and 540 detailed illustrations. The forward is by Sir Roger Penrose. In addition to the Springer webpage for my book, online links to my peer reviewed publications are provide in the Publications section of this website. For a list of my contributions to various books on Islamic art and geometric design, please go to the C.V. section of this website.